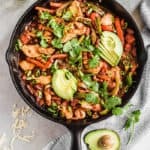 Fajita Chili Recipe (How to Make Chili) – An easy chili recipe that starts with fajita seasoning, peppers and onions resulting in new and exciting flavors to homemade chili. In a medium pot, heat olive oil over medium high heat. Add minced garlic and cook for 1 minute, then add diced onions, peppers and chicken, salt and pepper, and cook until chicken is cooked through and peppers and onions are softened. Next, add diced tomatoes, tomato sauce, and kidney beans then stir in fajita and chili seasonings. Lower the heat to medium low and slowly cook occasionally stirring chili until everything thickens (about 10-15 minutes). Salt and pepper to taste. Cool for 10 minutes to allow everything to further thicken and allow flavors to deepen.